The Attic Bar and BistroThe BarThe Latest from The AtticThe Latest From the Attic2014 Attic Improvements! So much is New and Improved at the Attic in 2014! We’ve made a number of changes to the inside of the Attic. After years of piecing together carpet and laminate flooring, we finally took the plunge and put beautiful new bamboo floors in the Back Room. 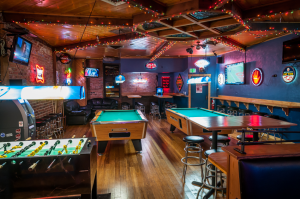 Following the floor project completion and a fresh new paint job/color scheme, we rearranged the back room to add additional seating and a lounge area as well as our host of games. The room is now much more “player-friendly” for pool players and foosball players alike. We most recently added 2 NEW soft-tip dart boards to our “stage area” to compliment our Multi-Play Old School 90-in-1 video game, 4-Person Pac-Man and Mega-Touch Machines. To say the Back Room is “Party Ready” is an understatement! Book your next social or company gathering at the Attic! You’ll be GLAD you did!